This was reviewed by me — and my book club, too. Their reviews are here. Mine follows. 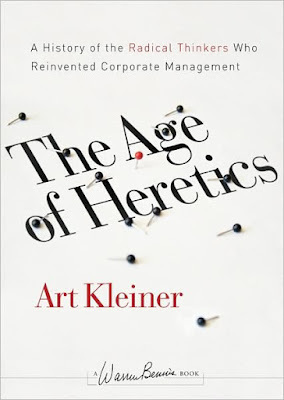 The Age of Heretics: A History of the Radical Thinkers Who Reinvented Corporate Management (2nd Edition). Jossey-Bass. Art Kleiner. 432 pages. A heretic is someone who sees things that others do not, yet is shunned and reviled by the authorities. I doubt that author Art Kleiner has been shunned or reviled, though he clearly sees things that eluded others. In this new edition of his book, Kleiner tells the stories of executives who looked for and found better ways of doing various aspects of business, and in the process, revolutionized their chosen field and often others, too. Each chapter of this book is prefaced with a profile of a religious heretic, serving as an unsubtle but effective foreshadowing. Kleiner is a skilled and sensitive writer, so even though his focus throughout is squarely on business, the human aspect of every interaction is always at the center of the story. In fact, this humanity is the story. He writes about a young worker who was bound in tape by co-workers for daring to work faster than the rest on his production line, managers who thwarted bold and productive initiatives by denying funding, and executives who feared empowering workers because it meant that their own authority and autonomy might be diminished despite any positive effects of the endeavor. In all of the tales Kleiner spins, it's easy to relate to these outcast rebels whose ideas threatened the status quo. But it's also simple to understand why disruptive ideas are often difficult to embrace because they represent major threats to the incumbents who feel they have little stake in a future that would surely displace the present. Any of us who ever attempted to introduce deviation to sacred standard operating procedures should have no trouble with this concept. To be ostracized for advocating improvement must be painful and frustrating — and unnecessary. Heretics is not a quick read, but well worth the time. Devotees of the ongoing crop of short, slick, glib biz books would do well to understand the roots of transformational business thought. Kleiner presents a broad and expansive look at the people and the changes they wrought. There's even a spiritual element to parts of the story, though quite distinct from the foreshadowing passages, which recount traditional heretical church-based conflicts. Kleiner packs a lot into his book. The story of how business guru Tom Peters got his start is interesting and funny, including the role that kidney disease, his frenetic loquaciousness, an auto accident and his severance agreement with his employer played in his career. But it's just one of many memorable and fascinating tales in this terrific collection.